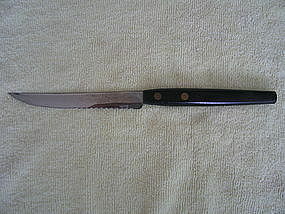 Vintage steak knife with stainless steel blade. There is no manufacturing information. It is 9 1/2 inches in length, with a blade measurement of 5 inches. I have additional identifying photos by email. Very little sign of use. There is a free one with purchase, due to one missing brad.